Having just bought a second-hand 1970 Story and Clark piano, I was interest in learning a bit more about the company that had made my piano. It turns out that Story and Clark has a long and interesting history in piano manufacturing, and is still being used as a piano brand name after the company changed ownership several times towards the end of the twentieth century. Story and Clark was founded in 1884 by Hampton L. Story, his son Edward H. Story and Melville Clark, an expert reed-organ builder. Story senior had started out working in a music store for $50 a month and saved enough to buy out the principal in 1859. He joined with various piano makers to start manufacturing Story and Powers pianos in 1862, then Story and Camp pianos and organs in 1868, before finally establishing Story and Clark pianos in 1884. 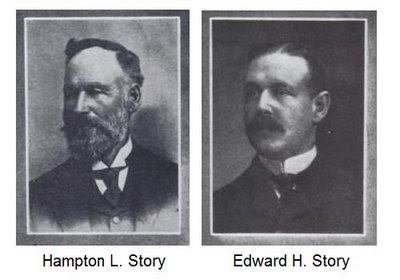 The Story and Clark business thrived and opened a factory in England in 1892 and another in Germany in 1893. Clark left the firm in 1901 to form his own company, and Story and Clark pianos moved to a new factory in Grand Haven, Michigan. Despite surviving the Great Depression and increasing sales during the post war years, the factory was eventually closed in 1984 and has since been redeveloped into over 60 condominiums priced from $159,00 to $795,00. The Story and Clark piano business had been sold to the Lowrey Organ Company in 1962, and sales slowly declined during the 1970s. When the factory closed in 1984, Lowrey split the piano and electronic keyboard businesses and sold them to different investors. In 1992 S&C pianos became a division of the Classic Player Pianos Corporation in 1990. In 1993 it was taken over by QRS Music Technologies, the descendant of the company founded by Clark in 1900! Pianos with the brand Story and Clark are still being produced, but are no longer manufactured in the US. have a Story and Clark piano / organ combination, S/N 240459. I don't know the age, but I bought it used in 1979. It is out of tune, but still works. I would like to sell it, but I don't know what it is worth, and I don't know who to contact about selling it (other than putting it on Craig's List!). I got an Story Clark spinet piano organ combo. It was left in a house I bought 10 years ago along with other 50s 60s furniture the deceased persons family didn't want. A piano tuner said that the action is worn and falling apart and would cost big bucks to replace. The piano buzzes in the backside but the organ is ok sounding with some vibrations buzzing the speaker cone. A friend of mine said my organ piano is a 1 off and very rare probably a Hammond prototype made by Story Clark and worth big bucks and I should get it fixed. He said it would sell for 20K. Piano repair guy said its not worth puttin money into cause noone wants spinets what goes here is my friend wrong or the piano repair dude? As far as I know, second-hand pianos tend to keep a reasonable resale value (at least better than most cars), as long as they are in good condition. However, pianos are much less popular that they were at the start of last century, so there is lots of supply and not so much demand -- not a good recipe for price appreciation. If you think you have a 'rare' and collectible piano (or piano-organ combination, for example) I'd suggest looking up a dealer of antique pianos. The piano tuner probably has a better idea of piano values than some random friend, but if it was a rare collectors item he could be wrong. No harm in sending a photo of it (and serial number, if there is one) to an antique piano dealer and asking for an opinion from an 'expert'.